Due to the sensitive natural areas found on St. Johns River Water Management District lands, compatible public recreation on most district-owned conservation areas is limited to non-motorized access, such as hiking, bicycling, horseback riding and primitive tent camping (no RVs), as described below. A parking area with an informational kiosk is provided at each property. These lands are open year-round from sunrise to sunset, though visitors should watch for signs posted on this website and at the property about closures due to maintenance/construction, natural disasters, etc. See details about operating hours of our Lake Apopka Wildlife Drive and Emeralda Marsh Conservation Area seasonal wildlife drive on those individual property pages. The district does not provide rental facilities, restrooms or shelters unless noted in the description of individual properties. Bicycling is allowed on many conservation areas and levees throughout the district as shown on the map for each area. Bicycle riders may ride on designated trails and established roads or fire lines, except where restricted by signs. Please view our camping page for more information. Dogs, cats or other domestic animals, excluding horses, are allowed on district land provided that they are leashed at all times. Domestic animals are allowed unleashed on district land if they are specifically authorized by a special-use authorization or district lease. Recreational fishing as authorized by the Florida Fish and Wildlife Conservation Commission (FWC) is allowed on district lands except where specifically restricted by signs. FWC requires any person engaging in recreational fishing to have appropriate fishing licenses in their possession, unless exempted by FWC. The license must be displayed upon request of any district, FWC or law enforcement employee. Fishing licenses can be obtained from the tax collector’s office of the applicable county. Licenses may also be acquired from certain FWC subagents, such as fish camps or sporting goods stores. Hiking, jogging, bird-watching or any other activity where travel is by foot only is allowed on district lands except in areas restricted by signs. Horseback riding is allowed on many conservation areas on trails in designated areas and established roads and fire lines, except where restricted by signs. 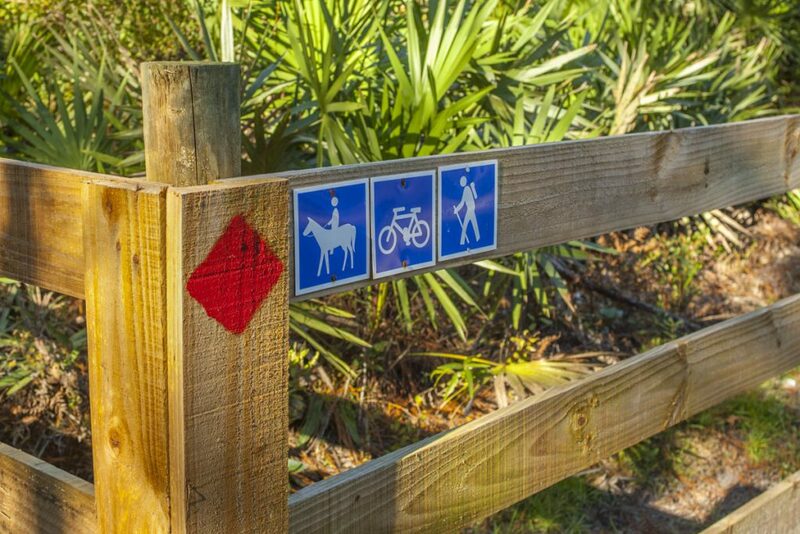 Check area maps for horseback riding opportunities. The district is committed to ensuring that all visitors, including those with physical challenges, have the opportunity to experience these natural areas. Several areas allow some level of year-round vehicular access, including properties in which the district is a partner with another agency that acts as the lead property manager. In addition to allowing limited vehicular traffic, some properties have interpretive drives or wildlife drives, such as Bull Creek, Emeralda Marsh (seasonal), Lake George, Lochloosa and Princess Place Preserve. Other properties feature accessible amenities such as fishing piers, boardwalks, walkways, observation platforms, picnic shelters and restrooms. District lands were primarily purchased to protect water resources. As a result, many marked trails are seasonally flooded. Likewise, district lands are diverse and many trails traverse several types of plant communities that thrive in soils ranging from loose “sugar sand” to wet organics, such as muck. Trails are minimally developed (with only minor vegetative trimming); are natural (non-improved, non-paved) surfaces and uneven with obstructions that include roots, stumps and other natural materials. Most trail access points located in the fence at each trailhead parking area have an all-terrain vehicle excluder post installed, although the width will accommodate wheelchair access. District conservation areas are generally “back country” lands and are more remote than state parks, with less chance to see another visitor. The district has no on-site staff. Each individual is responsible for determining his/her personal ability to access district trails safely. The Americans with Disabilities Act allows limiting access when unrestricted use of vehicles or an abundance of other power-driven mobility devices (OPDMDs) would create a substantial risk of serious harm to the immediate environment including natural and cultural resources, or pose a conflict and safety concerns with other non-motorized trail use by other visitors. To meet these concerns on district conservation areas that prohibit motorized access, the district has a process to provide accommodations to persons with permanent mobility impairments that limits their ability to walk. This process utilizes the Florida Fish and Wildlife Conservation Commission’s (FWC) alternative mobility permit, which allows the use of certain types of small OPDMDs on a limited basis. Individuals who submit an FWC Alternative Mobility Permit (AMP) will receive a District Special Use Authorization (SUA) for use of the OPDMD on the district land(s) identified in the SUA. The AMP allows mobility impaired persons to drive their OPDMD on interior service roads and firebreaks that are typically closed to the public, as they are used for land management purposes only. The OPDMD (all-terrain vehicles and golf carts with less than a 60-inch wheelbase) is to function solely as a mobility device for the individual, with a maximum speed of 5 mph. The AMP allows one assistant to ride along on the same OPDMD with the permit holder, but the assistant cannot operate a separate OPDMD. Wheelchair — A manually operated or power-driven device designed primarily for use by an individual with a mobility disability for the main purpose of indoor, or for both indoor and outdoor, locomotion. It must have a “main purpose” to include indoor, not just outdoor. Other power-driven mobility device (OPDMD) — Any mobility device powered by batteries, fuel, or other engines — whether or not designed primarily for use by individuals with mobility disabilities — that is used by individuals with mobility disabilities for the purpose of locomotion, including golf cars, electronic personal assistance mobility devices (EPAMDs), such as the Segway® PT, or any mobility device designed to operate in areas without defined pedestrian routes, but that is not a wheelchair as described in federal law. District lands are natural, wild and scenic places. Most properties offer no amenities such as rentals, restrooms or shelters. For your comfort, plan ahead. Maps in this guide are not intended for navigational purposes; they provide only the general location of each area. Restrictions and rules regarding the use of district lands are listed above. Other restrictions may apply. For more information on rules and where to obtain permits for specific activities, please see Using district lands (above), Who to contact, or Hunting information on this site. Subject to the limitations therein, Section 373.1395, Florida Statutes, provides that the district owes no duty of care to keep its park areas or lands safe for entry or use by others or to give warning to persons entering areas or lands of any hazardous conditions, structures or activities thereon. The district does not, by providing any of its park area or land for outdoor recreational purposes, extend any assurance that such park area or land is safe for any purpose; does not incur any duty of care toward a person who goes on park area or land; and is not responsible for any injury to persons or property caused by an act or omission of a person who goes on park area or land.